Sunday 9th September 2012 was the day for the independent transport videos cameras sixth visit to Liverpool for the annual Merseyside Transport Trust’s Running Day. This year we have made a change to the way in which we have filmed the event. We are going to show you the day in the life of a bus operator! From the buses leaving the depot in the morning, in service at various locations throughout the day and the arrival back at the depot in the evening. At the end of 2011 the MTT collection moved to new premises in Burscough, not far from their old home, but with superb conditions for vehicle storage and for on going preservation work for their fantastic collection. Our filming starts early Sunday morning. The buses are being prepared for a busy day out on the streets of Liverpool and our cameras record every departure in the early morning sunshine. Our next location is Liverpool South Parkway, which is reached by a ride onboard 1551 (OLV 551M) an open top Leyland Atlantean AN68/1R. A number of arrivals and departures are filmed, as well as some of the arrivals of other preserved buses for the static display. Our cameras now board another Atlantean, this time 1836 (TWM 220V) an East Lancs bodied example on service 77 running down to Pier Head for more action. Here we see both Ribble and Crosville buses mingling with the Merseyside ones recreating scenes from the 1960’s, 70’s and 1980’s. Leyland Atlantean 1003 (A323 GLV) is of the AN68D/1R type and has an Alexander H75F body – this is our bus for service 77A to Penny Lane. There is always plenty of action at Penny Lane, a busy interchange. A number of services pass through here and we have also included some shots of the current Arriva fleet, new low height Wright bodied Volvos, which makes an interesting comparison with Atlanteans and AEC Regents! We then board 1836 again for a run to Liverpool South Parkway via Woolton for our final visit of the day to capture the action. 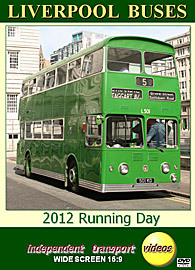 Our trip back to Burscough is on board Bristol LHS6L – ECW B27F, 2160 (MUA 45P). We first run in service as a 46 to Walton, then run light back to the depot. Here we film the buses returning and being parked up for the night. A brilliant day you will agree! We would like to give a big thank you to everyone that has been involved in organising this excellent Running Day and making us feel most welcome.